Some Google Apps users noticed a new option in Google Calendar: read-only offline access to the calendars using Google Gears. Mark Mathson has screenshots for the new feature, but it's surprising to see that Google Apps users, who usually received the updates later than Google Accounts users, get the offline Calendar earlier. Google's help page mentions that users can decide which calendars are available offline. "Calendar keeps you on time, even when you're not online. Offline Calendar allows you to access your events through your browser without requiring Internet access. It's perfect for flaky connections or for when you're in between meetings and have no idea where you're supposed to be next. Note that while offline, Calendar will be read-only - it will not be possible to create, edit, or delete events." It's interesting that the version briefly available in October 2007 allowed you to "view and edit the next 3 months of your Google Calendar when you're not connected to the Internet". Google decided that it's important to synchronize all the events and that editing the events is too difficult to implement reliably. I also have the feature available in Google Apps. I can confirm also. That option is in my Google Apps. Yes true..................I Have it and this is absolutely GOOGLE Planing to Kick off OUTLOOK FROM Market. First Gmail and now GCal. Good bye Microsoft heavy applications which slow down Systems when they are Active. I have it in my Apps account too. I also got offline Gmail in my Apps account before my normal Gmail account. Yep, it's here and it's awesome. It's fine to have no editing options, although it would be really nice. Now for regular Gcal support! It's a decent bandaid to the "total replacement to Outlook" problem. I have a copy of Outlook on my Windows build that I have sync'd with Google to provide a true offline copy of my calendar. It's rare between all of devices (Blackberry, iPod Touch, etc) that I'd need to use the Outlook backup, but it's there. Related though, if I need to print a hardcopy of my calendar for some reason, Outlook is greatly better than gcal IMHO. In all cases, a good step forward. The payed version allows for a chrome app download that enables it to edit and use it completely offline? Did I read this right? Too bad I ditched windows completely and would need Linux and Os X versions of it. But I would not install Win$ for just chrome and this app. The offline version of Google Calendar is now available for both Google accounts and Google Apps accounts. You only need Google Gears, a plug-in that works in Internet Explorer, Firefox, Safari and it's included in Chrome. Oh, and Google Apps is also available for free. 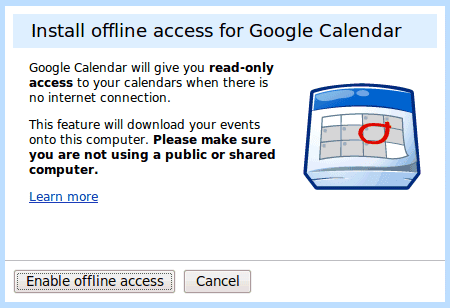 WILL SOMEONE PLEASE EXPLAIN HOW TO GO FROM OFFLINE TO ONLINE TO EDIT GOOGLE CALENDAR?